To bring the theme of man vs. nature (Pentheus vs. Dionysus) to life, AE staged The Bacchae in North Berkeley's John Hinkel Park. Appearing as a city that was literally being swallowed up by the wild, the park's Greek-styled amphitheatre and contrasting lush green hillside wrapped the audience into the experience like no other setting could. Director David Stein also carefully timed the play to open on Summer Solstice, a holy day in the pagan world. With a cast of 15 talented performers, including six dancers, three fine musicians, some great choreography and inventive costuming that mixed the modern with the classical, we think our foray into the world of outdoor free theatre was a successful one. Allyson Bradford (Chorus) is delighted to be working with AE for the first time. Most recently she was seen in CMT’s Animal Farm and the BOA Festival. She has appeared in several national and regional commercials as well as multiple print ads, industrials and plays in the Bay Area. David Fenerty (Messenger) is performing in his sixth AE production, following Rough Crossing, Travesties, Three Sisters, A Long Day’s Journey Into Night, and the staged reading of Helen of Troy (Revised). Since moving to California in 1999, David has also appeared in The Ghost of Molly Malone and a short film, Minute Matrimony. He hopes a tree branch doesn’t fall on him until he has written at least as many plays as Odon von Horvath. Jan Freifeld (Cadmus) is delighted to be in AE’s The Bacchae. Other roles and plays include George Hastings in She Stoops to Conquer at The Curtain Theatre in Mill Valley, Orgon in Tartuffe and Uncle Jack in Dancing at Lughnasa at Santa Rosa JC, Giles Cory in The Crucible at Santa Rosa Players, and ensemble roles in The Tempest, Twelfth Night, and Henry V at Sonoma Valley Shakespeare. Every role Jan has undertaken has been critically acclaimed by his wife and daughter. Emily Jordan (Chorus) is appearing in her first AE production with The Bacchae although this is her second appearance in Hinkel Park. You may have seen her last summer in Shakespeare’s Troilus and Cressida with the Shotgun Players. Recent theatrical performances also include The Fisherman’s Three Sons, Eugenia, and several appearances in the Thrillpeddlers’ annual Shocktobest! Extravaganzas. Emily originated the role of The Kidd in the world premiere of Kate Borstein’s Strangers in Paradox at Theatre Rhinoceros earlier this year. She is a member of the SF based Chameleon Theatre Company. 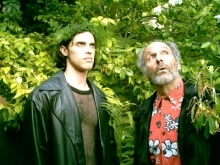 Bruno Kanter (Pentheus) has performed in the Bay Area for over six years. Favorite roles include Charles Condomine in Blithe Spirit for which he received Stage One’s Best Actor of the 2000 season and Laertes in Random Acts’ production of Hamlet. His most recent work has been the role of lawyer Joel Stein in Sisters at the Phoenix, and Father Raymond struggling with his beliefs in the West Coast premier of Awow at the New Conservatory Theatre. Both roles earned Bruno Dean Goodman Choice Awards. Sarah Korda (Chorus) has theatre credits that include work with Shakespeare Santa Cruz, the Odyssey Theatre, ACT, Eastenders Repertory, Theatre Rhinoceros and many more. You can also catch her in the films Simone’s 24 and Guerneville. Sarah is honored to work with AE. She would like to thank her friends, family and Maria for their support. Sarah lives and works in San Francisco. Donna Turner Lyle (Agave) recently starred in Town Hall’s production of The Women (Mary Haines). Professional credits include Guys and Dolls (Adelaide), City of Angels (Alaura), On Golden Pond (Chelsea), and Theatreworks’ regional premier of Ragtime. Donna won a Shellie Award for her work in Kindertransport (Helga) and received nominations for Sweeny Todd (Beggar Woman), City of Angels (Mallory), and Me and My Gal (Lady Jacqueline). Loving thanks to husband, Stewart and U2, Boo. Kendra Oberhauser (Chorus) most recently was seen in A Funny Thing Happened on the Way to the Forum at Antioch Rivertown Theatre and Over the River and Through the Woods at Contra Costa Civic Theatre, and will next be seen with San Leandro Players in Julius Caesar. Her favorite roles include Ruth from Blithe Spirit and Bubba from Summer of the Seventeenth Doll. This is her first appearance with AE and her first Greek tragedy. Ross Pasquale (Dionysus) most recently appeared at the Exit Theatre in 2 consecutive productions: John Fisher’s Queer Theory and the world premier of Never Far from the Tree. Previous credits include the world premier of The Fisherman’s Three Sons at the Intersection for the Arts, Julius Caesar and Antony and Cleopatra with Subterranean Shakespeare and The Tempest at College of Marin. He completed a Stanislavsky Intensive through American Repertory Theatre/Moscow Art Theatre School where he played Dorn in The Seagull. Lindsey Pratt (Chorus) is pleased to be working on this, her third show with AE. She has also appeared with AE in The Heidi Chronicles and Three Sisters. Most recently she has appeared as Curley’s wife in Of Mice and Men with Marin Classic Theatre. Ozem Roberts, Joha Williams (Drums) are both in their second year of study at the Ethnic Arts Institute for traditional music and art. They major in Anlo-Ewe music of Ghana, and have apprenticed under drum masters from both North and South America. Cheree Sager (Chorus) is delighted to be working with AE in this production. She recently made her San Francisco debut with Impact Theatre in John Fisher’s Queer Theory. Other favorite roles include Julia in Two Gentlemen from Verona, and Alain Boutros in Red Noses. She is a graduate of the University of North Carolina Chapel Hill, as well as ACT’s Summer Training Congress, and continues to study in the studio ACT program. Cheree would like to thank her friends, family, and Joshua for their undying support. Brian Buckley Smith (Teiresias) is a native of Queens, New York who has lived in the Bay Area for the past seven years. He is pleased to be working with AE for the first time. Recent roles include Snowball in Animal Farm and Egeus in Midsummer Night’s Dream. Brian feels truly privileged to be able to perform plays and share the magic of live theatre. Brian lives in Oakland with his wife Laurel and their 4 cats. His personal motto is: "Always keep ‘em guessin". David Stein (Director/Servant) has been acting most of his life and performing in the Bay Area for the past 5 years. This is his second AE show. Last year he played Peter Patrone in The Heidi Chronicles. Most recently he was in Killing My Lobsters Bruno’s Island new play festival Ode to the Cupcake, and CCCT’s production of Over the River and Through the Woods. This August you can see him in Play on Words at the Jean Shelton Theatre in San Francisco. He’s overjoyed to be making his directing debut with AE. Chie Takeuchi (Flute) graduated from the Conservatoire de Lille in France and Musasino Music University in Tokyo Japan. She has won 1st prizes at 2 international competitions in France. She has played for an orchestra in Japan as a flutist and piccoloist. Rev. G Randall Wright (Second Messenger) is a dancer, actor, musician, clown and Reverend (Church of Magical Love) and hails from New Mexico, New York, Taiwan, etc. Being doubly, nay, triply inspired by his expulsion from Clown School, he crusades tirelessly the word of Love through rock-a-lele and other mediums.